Yesterday, my wonderful mother-in-law took us to Sam's Club and used her membership so we could purchase a jumbo pack of Pampers Swaddlers. I couldn't wait to break into them, but decided to try to hold off until we used the last of the Huggies. After yet another poop explosion at 5:30 in the morning which dirtied not only my little boy but also his pajamas, I decided that we would part ways with Huggies and break into the package of Pampers. My undying love for Pampers is well-warranted; we have had several very heavy diapers since we made the switch and have had no leaks. Beyond the high-quality of the diapers themselves, the front of each diaper is equipped with a yellow stripe which turns blue when the diaper is wet. The pee stripe is one of the best diaper-related inventions I have found in my quest to make diaper changes effortless; while poop-laden diapers are hard to miss, a slightly-wet diaper can easily be overlooked without the color-changing stripe. 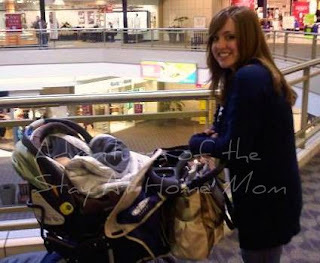 Beyond the Pampers experience, today was also the first day that we used our stroller! Jonathan and I decided to go to the mall today to make a few Christmas exchanges and we brought our stroller, equipped with the carseat adapter, to make the experience easier. We have the Safari In-Step Swivel Wheel Jogging Stroller. Obviously, Nathaniel is too young to use the jogging function but he's not too small to use the stroller for a walk in the mall! The In-Step Jogger turns on a dime and pushes smoothly enough to easily direct with one hand, a must for a busy mama! The stroller also has several storage compartments, one near the handlebar and one underneath the seat, providing plenty of extra space for those bulky shopping bags! The only thing I dislike about the stroller is the weight; it is quite heavy and difficult to lift into and out of our car. Despite the difficulty in transporting the stroller, this is an essential piece of baby gear that I would happily recommend to any of my friends. It's high-quality, easy to use, and built to last, perfect for a mama on-the-go! I can't wait till we are out of regular Pampers and can just use snugglers. Regular Pampers are worse than Huggies. They don't even have the pee stripe. LOVE Pampers Swaddlers!!! Just had a sweet baby girl a week ago :-) I love the change of a yellow line to a blue line that indicates that a little "pee pee" has occured!